Home Edu News Is a 'waiver' worse than a 'haircut'? 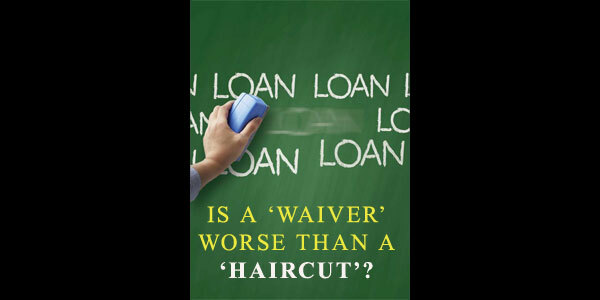 What's the difference between a 'haircut' and a 'waiver'? If it were just a matter of semantics, we could have dismissed it as a 'mistake of category'. But the distinction is crucial, especially when viewed against the ongoing debate on recovering bank loans. With the Indian banking sector at a point of inflection, such terminologies suggest inherent biases and preferences. First, let us take bank lending to the corporate sector. It is by now well recognised that corporate loans make up the biggest share of bad loans, especially in Government-owned banks, constituting not less than 70 per cent of the total non-performing assets. For instance, the first 12 borrowers referred to the National Company Law Tribunal (NCLT) themselves owe close to above Rs. 2,50,000 crore and the key word for resolution here is a ‘haircut’. It is neat. Or, at least that is what the nomenclature implies. In much the same way that on a weekend you would go to a salon and get the excess hair off your head, banks which have lent large sums of money to major companies have taken/are readying to take a ‘haircut’ by selling or disposing of these loans. Banks will consider themselves lucky if they recover at least 50 per cent of the monies lent to these companies. At the other end of this spectrum of defaulters are the country’s farmers. Distressed by unremunerative prices of commodities, increase in labour costs and lack of infrastructure support, millions of them are leading subsistence lives, with just about enough income to meet their daily needs. A few State Governments have announced partial/full ‘waivers’ of these loans which aggregate to not more than Rs 1.5/Rs 2 lakh per borrower. In both these segments, the exchequer bears the ultimate cost; it could be through recapitalisation from the Centre, or by way of States bearing the agri debt waiver cost, since agriculture is a State subject. From a banking perspective, both have equally negative implications, surely. But, somewhere between the ‘haircut’ and the ‘waiver’ lies the story of a sector which has suffered neglect at the hands of policymakers and has been witnessing frequent bouts of financial stress and personal misery. According to the latest All-India Rural Financial Inclusion Survey conducted by National Bank for Agriculture and Rural Development (NABARD), the average monthly income for agricultural households is Rs. 8931, of which 35 per cent comes from cultivation and another 34 per cent comes from wage labour. This is even lower than the NSSO (National Sample Survey Office) data (SAS Round 70) findings, cited by Economic Survey 2016-17, according to which the average annual income of the median farmer is less than Rs 20,000 in 17 States. The NABARD study observes that the other income sources are livestock rearing (8 per cent), Governmentt/private service (16 per cent) and others (7 per cent). The NABARD survey further states that the average outstanding debt per agricultural household was Rs 1,04,602. This in brief sums up the position of agricultural households in the country, and the position is corroborated anecdotally during field visits. A rich farmer is an oxymoron, in the current context, particularly among small and marginal farmers with land ownership up to two hectares, who constitute nearly 84 per cent of all farmers (based on operational holdings as per the Agricultural Census of 2010-11). Apparently, these financial indicators are at variance with output per se from the farming sector. Whether it is the total foodgrains production (277 million tonnes), horticulture (300 million tonnes) or milk products (176 million tonnes), the country has made great strides, thanks primarily to the public investments in agriculture up to the Eighties. Strangely, this problem of plenty has recoiled to hit farmers hard as market prices of grains, pulses and perishables have been, for the last few seasons, ruling at unremunerative levels in relation to costs. With average wage levels having climbed up in rural areas thanks to the rural employment guarantee scheme, restrictions imposed by the mandis that are yet to be removed completely, and other curbs such as the minimum export prices (MEP) on items like tomato, onion and potato - it becomes a struggle for growers to sell at fair prices. The Minimum Support Price (MSP) scheme helps mainly only paddy and wheat. Procurement agencies other than FCI which deal with pulses face difficulties in buying, storing and paying to farmers effectively and in time, owing to logistical issues. That State support is required for making agriculture sustainable is a truism. The world over, Governments subsidise farming in one way or the other. The holy land of free enterprise, the United States spent at least $20 billion last year on farm subsidies. Some estimates put the quantum of farm subsidies at almost 50 per cent of the total agricultural output in the US, whereas in India it has been hovering around 10 per cent of farm output. While the actual subsidies paid in the developed countries may never be fully revealed (as WTO focuses only on ‘trade-distorting’ subsidies) it is extremely important in our national interest not to be apologetic about supporting agriculture. It is an area as important and significant as defence and there is need for a consensus among policymakers, regulators and the financial sector that subsidisation is continuously required for this sector in the interests of food security, low inflation levels (as food items have a weightage of 45 per cent in the consumer price index) and gainful employment in rural areas. One of the stark realities of the post-liberalisation era has been the continuous decline in the public investment in agriculture. While Gross Capital Formation (a proxy for investments) in the public sector for agriculture used to be above 10 per cent of the total GCF up to the mid-Eighties, the latest data available indicate a declining trend with GCF hovering around 5 per cent since 2010. The Modi Government has been earnest in its intention to boost farm incomes, and there are no obvious short-term solutions. Even as the agri debt waivers are being faulted for their overall negative impact, it has to be acknowledged that these populist band-aids have been necessitated by the neglect of public investments in agriculture for the last 30 years and more.